Selvage Blog: Sewing Machine Thingys! Thanks to Joan Jordan for this educational diagram. Finally, answers for inquiring minds! I'd like to have an "unobtainium," but you just can't get them! Know what I mean? OMG! NOW I understand it all! Thank you for this very instructional diagram. 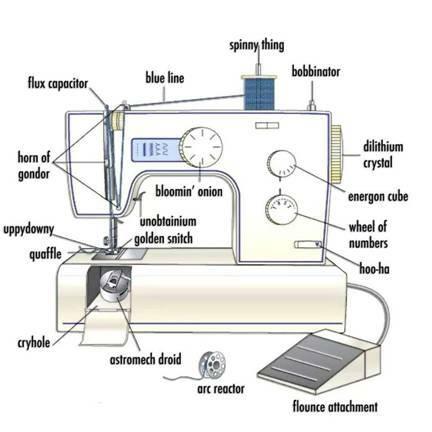 I'm going to keep it close at hand so that I know how to explain problems to the sewing machine technician! That is so funny. Like Karen H said, these will be invaluable when trying to explain the problem of the sewing machine to a non-tecky person. Thanks for the laugh. I Brake for Fabric Too!